Blitzortung is a community project of lightning detection stations. In summary, every participant has a detection station which is connect to the internet and sends all the "event" information to a server in Germany. The data is synchronized to GPS time, and processing at the server computes the lightning strike locations. I have been operating a station in Bangkok since mid 2014. The hardware at each station consists of a wide band width LF radio receivers. The signal is digitized and pre-processing to select events that are possible lightning events. A GPS receiver records the GPS time and each event is time stamped, then the data sent to the server in Germany. Three types of signals are recorded, and these are the electric field from a vertical wire antenna, and the two horizontally polarized magnetic fields from orthogonal horizontal ferrite antennas. Each strike has to be recorded by multiple stations so that an accurate location be determined... and this is weak point of my station. 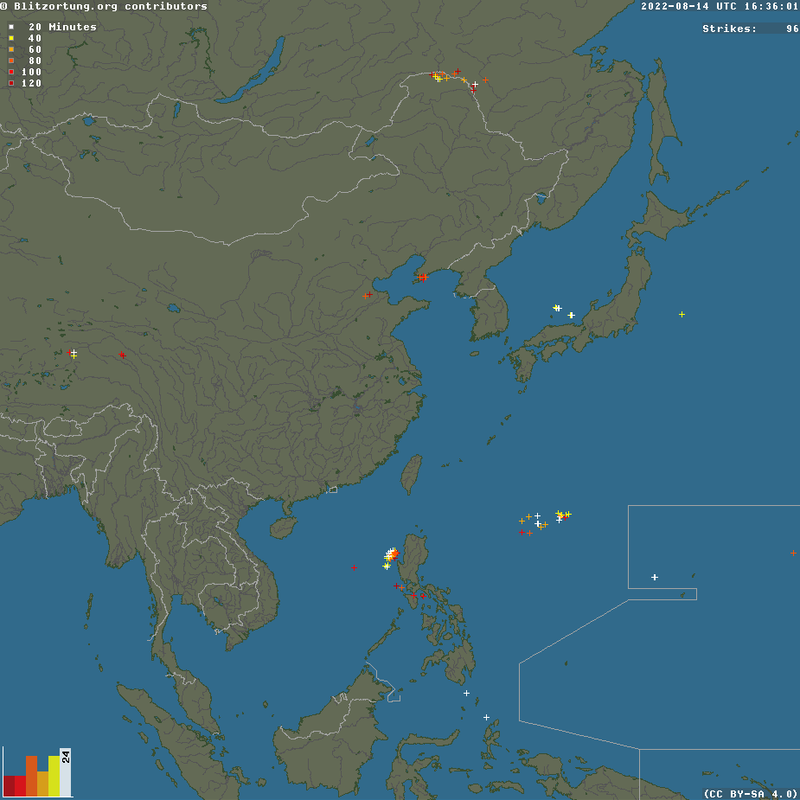 Although it can detect a large number of events, then are very few other stations in this part of the world, so I don't get many located strikes. Continue to hope that more stations nearby will pop up in the future. Click here for a link to the details of my Lightning detector station. A link to the acquisition website can be found here. The image below is latest event that has been recorded at my Bangkok station.